Soon after you, or your spouse, file for divorce your attorney will likely inform you of the Automatic Orders, under 22 NYCRR § 202.16-a. 22 NYCRR § 202.16-a basically provides that, in every matrimonial action after the service of the summons, restrictions are placed on the transfer of the assets of the marriage without the consent of the other party to the divorce or court order. In the estate planning context the most relevant is provisions are 22 NYCRR § 202.16-a(c)(2) and 22 NYCRR § 202.16-a(c)(5). 22 NYCRR § 202.16-a(c)(2) states, “[n]either party shall transfer, encumber, assign, remove, withdraw or in any way dispose of any tax deferred funds, stocks or other assets held in any individual retirement accounts, 401K accounts, profit sharing plans, Keogh accounts, or any other pension or retirement account…” What this means in the context of estate planning, is that during the pendency of your divorce you cannot change the beneficiary designations on any of your retirement accounts. 22 NYCRR § 202.16-a(c)(5) provides that, “Neither party shall change the beneficiaries of any existing life insurance policies, and each party shall maintain the existing life insurance … policies in full force and effect.” Similar to retirement accounts, what this means in the estate planning context, is that you cannot change your life insurance beneficiary until after your divorce. Another consideration related to life insurance and estate planning during the pendency of your divorce, is purchasing any new life insurance in an Irrevocable Life Insurance Trust (“ILIT”). If you are going to be subject to spousal maintenance (formally known as “alimony”) and/or child support, you will very likely be mandated to take out a new life insurance policy or continue to maintain an enforce policy, with either your spouse or children as the beneficiary, to “guarantee” your spousal maintenance or child support payments, should you pass away before your support obligation is completed. The full workings of an ILIT are beyond the scope of this article, but if you may have a taxable estate upon your passing, purchasing the new life insurance policy to cover your support obligations in an ILIT, may be a good idea, in order to remove that new life insurance policy from your taxable estate. This is something to discuss with both your matrimonial attorney and estate planning attorney, prior to agreeing to a final settlement. The main point of the article is that, although by the time a judge signs your decree of divorce and you are officially divorced, you may want to take a break from spending any time with a lawyer for a while, it is imperative that you revisit your estate plan. Most likely your current estate planning documents heavily include your former spouse. New York law recognizes this and therefore, New York Estates, Powers, and Trusts Law (“EPTL”) § 5-1.4, specifically addresses the issue of divorce on a person’s estate. EPTL § 5-1.4(a) provides that, any distribution to a former spouse in a Will, revocable trust, as beneficiary of a retirement account, as beneficiary of a life insurance policy, or other beneficiary designation, and any power of appointment, is revoked. Also interest in real property held as joint tenants with the right of survivorship is severed and converted into a tenancy in common interest, meaning upon your passing your interest in the property would pass to your heirs rather than to your former spouse. EPTL § 5-1.4(a) also revokes the former spouse’s appointment as fiduciary under any estate planning document, meaning they would no longer serve as your executor, trustee, health care agent, guardian or attorney-in-fact. 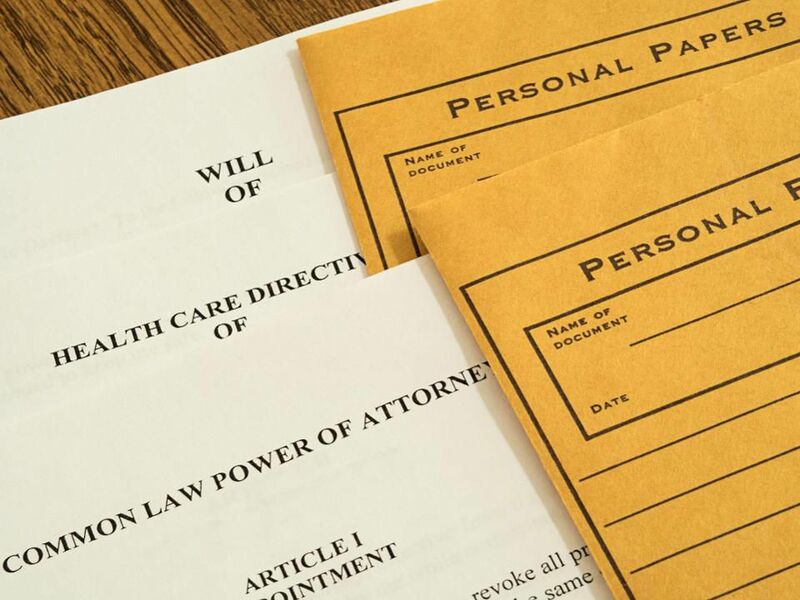 EPTL § 5-1.4(b) provides that your estate planning documents should be read as if your former spouse had predeceased you. Therefore, your alternate beneficiaries would take under your Will or revocable trust, as well as under your life insurance policy and retirement accounts. Also, your successor fiduciary appointments would act, rather than your former spouse. One important caveat to EPTL § 5-1.4, is that it only applies after a court has entered a final decree or judgment of divorce or final decree or judgment of separation. This means if you die during the pendency of your divorce the provisions of your estate planning documents that provide for your spouse or appoint your spouse as your fiduciary will still be effective. Although on the surface EPTL § 5-1.4 appears to completely remove your former spouse from your estate plan, EPTL § 5-1.4 should be viewed as a back stop and not a panacea. For example, although any distributions to your former spouse are revoked, this does not pertain to their friends and family. If your Will provides that if you are not survived by a spouse or children or grandchildren that your assets be split equally between your family and your spouse’s family, which is a very common provision, then the distribution to your former spouse’s family is still in effect. Also in effect, any specific bequests to your spouse’s friends and family and any appointments of your former spouse’s friends or family as your fiduciary. Your brother-in-law may have seemed like a great alternate health care agent when you originally signed your estate planning documents, but do you want him making your health care decisions now that you’ve divorced his sister? Another reason to revisit your estate plan is that your settlement agreement with your former spouse may have included the agreement to provide for your former spouse in some way in your estate. It is not uncommon for a former spouse to negotiate the receipt of a lump sum payment upon the passing of their former spouse to account for the loss of maintenance or other support. If your estate plan is not updated to reflect this payment you are in violation of your settlement agreement and your former spouse can bring an action against your estate. This just adds unnecessary expense and complication to your estate. Since many settlement agreements include aspects that could affect your estate plan, it is imperative that you provide a copy of your settlement agreement to your estate planning attorney, so that they may review it and craft your estate plan to be in compliance with your settlement agreement. Additionally, upon entry of the final decree or judgment of divorce the Automatic Orders, discussed above, are no longer in effect. This means that it is a good idea to review your beneficiary designations under your life insurance policies and retirement accounts to confirm that your non-probate assets will be distributed in the manner you wish to have them distributed. Again, you must use caution to not violate the provisions of your settlement agreement in changing your beneficiary designations. Lastly, in divorcing your spouse you have just lost half of the estate tax credit you may have planned on having available upon your passing. Without a spouse many estate tax planning techniques, such as the use of a credit shelter trust, are obviously, no longer applicable. If you are going to have a taxable estate, it is a good idea to review your estate plan with your estate planning attorney to potentially implement some alternate estate tax planning strategies now that you can no longer count on your spouse’s estate tax exemption. The decision to divorce and the divorce process are rarely easy. After divorce many people are emotionally drained. However, revisiting your estate plan is critical after a divorce to update your wishes based on your new life circumstances. The estate planning attorneys at Twomey, Latham, Shea, Kelley, Dubin & Quartararo are available at your convenience to answer your questions, review your current estate plan in conjunction with your settlement agreement or decision by the court and help you to implement an updated estate plan. As of January 1, 2019, the federal estate tax exemption amount is $11,400,000.00 meaning anyone with an estate below that threshold will not be subject to federal estate tax. As of January 1, 2019, the New York State estate tax exemption amount is $5,740,000.00, meaning anyone with an estate below that threshold will not be subject to New York State estate tax.